Hungarian physician; born at Lackenbach March 15, 1815; died at Budapest May 19, 1885. Educated at Nagy-Kanizsa, Szombathely, Pesth, and Vienna (M. D.), he began in 1843 to practise medicine at Pesth; and five years later the Hungarian government appointed him head physician of a military hospital, making him chief physician of the house of detention and poorhouse of Pesth in the following year. He was decorated with the gold medal for art and science in 1858, and received the cross of the Order of Francis Joseph in 1866, having been elected a member of the Hungarian Academy of Sciences two years previously. He was elevated to the Hungarian nobility with the name "Muraközi." 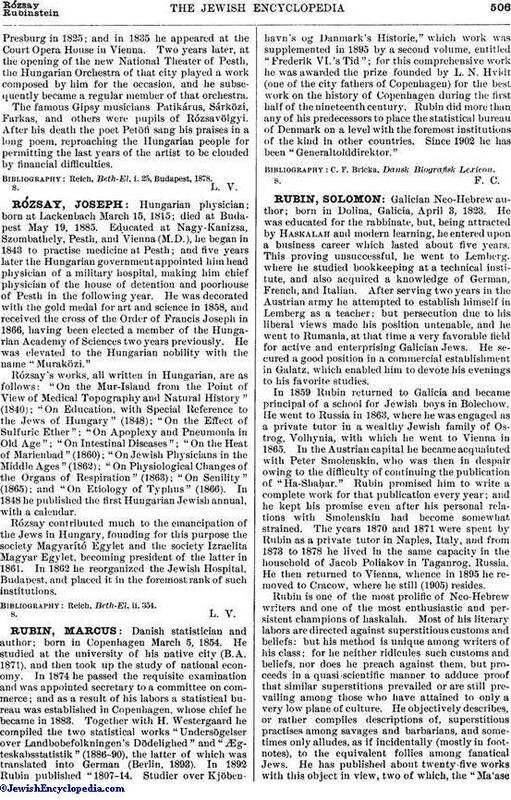 Rózsay's works, all written in Hungarian, are as follows: "On the Mur-Island from the Point of View of Medical Topography and Natural History" (1840); "On Education, with Special Reference to the Jews of Hungry" (1848); "On the Effect of Sulfuric Ether"; On Apoplexy and Pneumonia in Old Age"; "On Intestinal Diseases"; "On the Heat of Marienbad" (1860); "On Jewish Physicians in the Middle Ages" (1862); "On Physiological Changes of the Organs of Respiration" (1863); "On Senility" (1865); and "On Etiology of Typhus" (1866). In 1848 he published the first Hungarian Jewish annual, with a calendar. Rózsay contributed much to the emancipation of the Jews in Hungry, founding for this purpose the society Magyarító Egylet and the society Izraelita Magyar Egylet, becoming president of the latter in 1861. In 1862 he reorganized the Jewish Hospital, Budapest, and placed it in the foremost rank of such institutions.